Each release of DFSMS builds upon the previous version to provide enhanced storage management, data access, device support, program management, and distributed data access for the z/OS® platform in a system-managed storage environment. This IBM® Redbooks® publication provides a summary of the functions and enhancements in z/OS V1R9 DFSMS. 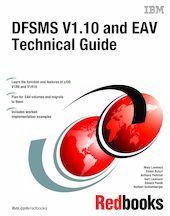 It then provides an in-depth technical description of the functions and enhancements in z/OS V1R10 DFSMS. It provides you with the information that you need to understand and evaluate the content of this DFSMS release, along with practical implementation hints and tips. Also included are enhancements that were made available through an enabling PTF that has been integrated into z/OS DFSMS V1R10. z/OS V1R10 provides Extended Address Volumes (EAV), a capability that enables support for over 54 GB of addressable storage, removing a limitation in place today. Initially EAV is planned to support up to 262,668 cylinders (up to 223 GB of addressable storage) per volume, allowing you to simplify storage management by providing the ability to manage fewer, larger volumes as opposed to many small volumes. This book provides detailed information about planning, implementing and migrating to EAVs.